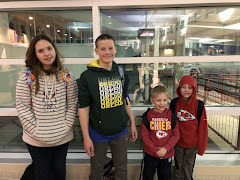 A Borderline Mom: Bye, bye Bottle! With A & L, they both took pacifiers from day one. I have come to realize how much of a blessing that actually was, despite it taking awhile for me to wean them off (A was 2 and L was 3). However, they were beasts to get to sleep. You had to lie with A until she fell asleep and you pretty much had to walk with L until he fell asleep. Then in the middle of the night L woke up anytime his pacifier fell out... it was ridiculous. Well, when H refused a pacifier since birth, he started going to sleep with warm milk in his bottle. For the first time I was able to put a kid in bed with a bottle and they'd go to sleep! It was a miracle. Yes, yes, I know, you aren't supposed to put them to bed with a bottle, but it was milk, not juice, and... mind your business, lol! BTW, his teeth are perfect. So it has made breaking him of his bottle quite difficult since there's not really another way to get him to sleep. A & L were off their bottles by one, which is the recommendation. H is now 20 months, so I felt a little like a failure in that department. His pediatrician said that sometimes you have to pick your battles and his teeth and gums looked great. I've tried sippy cups with warm milk- he hates sippy cups. He only drinks water and juice out of one of those rubber straw cups. 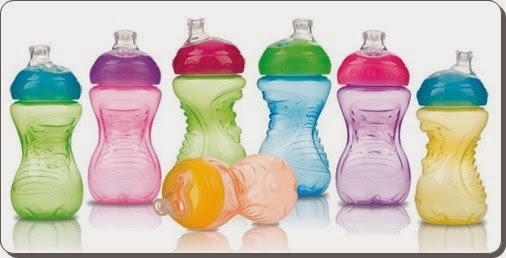 Then a bit of hope- a friend and I were talking about the bottle issue and she recently broke her one year old of her bottle by using one of the Nuby cups that has a rubbery spout, but it is not stiff, it is more flexible, but it is the second stage after sippy cup. I immediately went out and bought three. The first day when I put warm milk on it he cried and wouldn't take it. Every time he said "ba," I gave him that cup. So the first day was rough. He would drink sips here and there, but really doesn't want it. For bedtime he fell asleep on my lap fussing. I felt bad, but usually cold turkey works and I was not going to give in. The second day was a little better. I would have to set the cup near him because he wouldn't take it, but eventually he would go pick it up and drink about half. Fast forward a week and he's completely off the bottle! He chugs his Nuby cup and falls asleep. He has been falling asleep in his infant-to-toddler bouncer with the cup, so when we lie him in bed he just rolls over and stays asleep. I am so grateful to that friend for putting the idea out there for me. I don't know why I hadn't thought of it before, when him being my third child, but there you have it. Yes, he still likes his warm milk, but it's not a bottle. And it is a stage above sippy cup, which is above bottle, so I will take it! I think with age will come going to sleep without the warm milk, but I'm not as worried about that. Now with Baby A, I am trying to get him interested in the pacifier so when he falls asleep it is either with the bottle, breast or pacifier, but we wills see how that goes. I was also using Nuk pacifiers, but received some MAM pacifiers to review, and he seems to like those better. I'm not saying this is guaranteed to work with every child being weaned, but it worked for H! Hooray! !